For the book by Edward Grey, 1st Viscount Grey of Fallodon, see Fly Fishing (book). For the Yellow Pages advert, see J. R. Hartley. Fly fishing is most renowned as a method for catching trout, grayling and salmon, but it is also used for a wide variety of species including pike, bass, panfish, and carp, as well as marine species, such as redfish, snook, tarpon, bonefish and striped bass. Many fly anglers catch unintended species such as chub, bream and rudd while fishing for 'main target' species such as trout. A growing population of anglers[who?] attempt to catch as many different species as possible with the fly. With the advancement of technology and development of stronger rods and reels, larger predatory saltwater species such as wahoo, tuna, marlin and sharks have become target species on fly. Realistically any fish can be targeted and captured on fly as long as the main food source is effectively replicated by the fly itself and suitable gear is used. Although anglers in Scotland and Ireland had been fishing the lochs and loughs for trout with an artificial fly for several generations (as far back as 1840 John Colquhoun listed the menus of fly dressings in his book The Moor and Loch detailing the wings, body and hackle of artificial flies in use at the time), the history of stillwater trout fishing in English reservoirs goes back little more than a century. 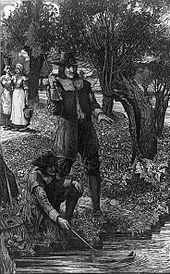 The simple reason for that was because (apart from the Lake District which was somewhat isolated before the construction of the railways) England possessed few large stillwaters that contained trout. That all changed when the water supply reservoirs began to be built to meet the increasing demand for water from the big cities. The earliest of these reservoirs to be stocked with trout were Thrybergh Reservoir close to Doncaster completed around 1880, Lake Vyrnwy, Powys in 1891, Ravensthorpe Reservoir in Northamptonshire in 1895 and Blagdon Lake in Somerset which was first opened as a trout fishery in 1904. In southern England, dry-fly fishing acquired an elitist reputation as the only reliable method of fishing the slower, clearer rivers of the south such as the River Test and the other chalk streams concentrated in Hampshire, Surrey, Dorset and Berkshire (see Southern England Chalk Formation for the geological specifics). The weeds found in these rivers tend to grow very close to the surface, and it was necessary to develop new techniques that would keep the fly and the line on the surface of the stream. These methods became the foundation of all later dry-fly developments. F. M. Halford was a major exponent and is generally accepted as "The Father of Modern Dry Fly Fishing." The legacy of Dr Howard Alexander Bell (1888-1974). 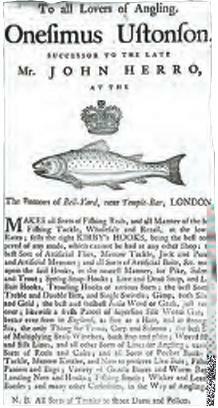 Although he never wrote a word about fishing and shunned publicity, Dr Bell of Blagdon had the greatest formative influence of any man on the development of reservoir fishing in the first half of this century. In those days Blagdon was fished with spinners or with traditional sea-trout and low-water salmon flies. Fly fishing was carried out from boats and bank during the evening rise. Daytime fishing with the fly was thought to be of little use. Bell had read Skues and, following his example, used a marrow spoon to spoon out the trout he caught (one of his friends said, ‘He would spoon out his grandmother if he thought there was anything in her’). The stomach contents of the Blagdon trout were a revelation. There was nothing there but small larvae and pupae, among them the pupae of the famous black midge. Dr Bell tied artificials to represent the insects that he found in the Blagdon trout, including bloodworms, midge and sedge pupae and beetles. His flies were quite small, 10s, 12s and sometimes 14s. He might have a Worm Fly on a single hook on the point, a Grenadier (caddis pupa) on the middle dropper and a Buzzer (midge pupa) on the top. All his dressings were plain and simple. Nevertheless in the 1920s and 30s he set the scene and pointed the way in which imitative patterns of underwater insects were to develop as one of the major techniques of reservoir trout fishing. Saltwater flyfishing is typically done with heavier tackle than that which is used for freshwater trout fishing, both to handle the larger, more powerful fish, and to accommodate the casting of larger and heavier flies. Salt water fly fishing typically employs the use of wet flies resembling baitfish, crabs, shrimp and other forage. However, saltwater fish can also be caught with poppers and other surface lure similar to those used for freshwater bass fishing, though much larger. Saltwater species sought and caught with fly tackle include: bonefish, redfish or red drum, permit, snook, spotted sea trout, tuna, dorado (mahi-mahi), sailfish, tarpon, striped bass, salmon, giant trevally and marlin. Offshore saltwater species are usually attracted to the fly by "chumming" with small baitfish, or "teasing" the fish to the boat by trolling a large hookless lure (Billfish are most often caught using this latter method). In broadest terms, flies are categorised as either imitative or attractive. Imitative flies resemble natural food items. Attractive flies trigger instinctive strikes by employing a range of characteristics that do not necessarily mimic prey items. Flies can be fished floating on the surface (dry flies), partially submerged (emergers), or below the surface (nymphs, streamers, and wet flies). A dry fly is typically thought to represent an insect landing on, falling on (terrestrials), or emerging from, the water's surface as might a grasshopper, dragonfly, mayfly, ant, beetle, stonefly or caddisfly. Other surface flies include poppers and hair bugs that might resemble mice, frogs, etc. Sub-surface flies are designed to resemble a wide variety of prey including aquatic insect larvae, nymphs and pupae, baitfish, crayfish, leeches, worms, etc. Wet flies, known as streamers, are generally thought to imitate minnows, leeches or scuds. Throughout history, artificial flies constructed of furs, feathers, and threads bound on a hook have been created by anglers to imitate fish prey. The first known mention of an artificial fly was in 200AD in Macedonia. Most early examples of artificial flies imitated common aquatic insects and baitfish. Today, artificial flies are tied with a wide variety of natural and synthetic materials (like mylar and rubber) to represent all manner of potential freshwater and saltwater fish prey to include aquatic and terrestrial insects, crustaceans, worms, baitfish, vegetation, flesh, spawn, small reptiles, amphibians, mammals and birds, etc. ^ C. B. McCully (2000). The Language of Fly-Fishing. Taylor & Francis. p. 41. ^ a b Andrew N. Herd. "Fly fishing techniques in the fifteenth century". ^ Herd, Andrew Dr (2001). The Fly. Ellesmere, Shropshire: Medlar Press. ISBN 1-899600-19-1. ^ Westwood, T.; Satchell W. (1883). Bibliotheca Piscatoria. London: W. Satchell. pp. 39–40. ^ Herd, Andrew (2010). "Alfred Ronalds—The First Angler Entomologist". Angling Giants—Anglers Who Made History. Ellesmere, UK: The Medlar Press. pp. 250–253. ISBN 978-1-899600-60-1. ^ a b c "fishing". Encyclopædia Britannica. ^ Hayter, Tony (2002). F.M. Halford and the Dry-Fly Revolution. London: Rober Hale. p. 98. ISBN 0-7090-6773-9. ^ Schullery, Paul, ed. (2007). "Introduction". Halford and the Dry Fly. Mechanicsburg, PA: Stackpole Books. pp. ix–xv. ISBN 0-8117-0272-3. ^ Cook, Jack. "Spey Fly Fishing - Demystifying the Two Handed Rod". Retrieved 2009-05-19. ^ Erickson, Jeff (2 June 2014). "Extraterrestrials: 12 Best Terrestrial Flies for Trout Fishing". Outdoor Life. Bonnier Corporation. Retrieved 17 September 2015. Voss Bark, Conrad (1992). 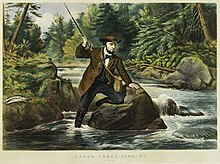 A History of Flyfishing. Merlin Unwin Books. Voss Bark, Conrad (1999). New Encyclopaedia of Fly Fishing. Robert Hale. ISBN 978-0709-063087.